Arrival from 7.45 pm with the meeting starts at 8pm sharp with news and announcements from the Chairman who will then hand over and welcome our guest speaker. 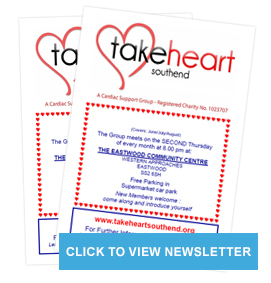 Take Heart Southend has regular events and meetings to keep our members entertained and informed. We have regular outings to add a supportive and friendly social element. We also hold meetings that can give more information on Heart Disease along with other interesting topics. To advertise in Future Editions of our magazine – click here! Some people like to take a more active role in our events and at Take Heart we are keen to listen to ideas and suggestions by members. If you are able to give a helping hand, please speak with a committee member when attending one of our meetings. If you are unable to attend but still wish to help, or if you have something to offer that may be of benefit to Take Heart please get in touch. Please have a click around and get your bearings in our Interactive Map. You are able to Zoom, Pan and change the view to aid you.